FOX Sports will be giving University of Florida Quarterback Tim Tebow pure adulation and love tonight on their broadcast of the 2010 Allstate Sugar Bowl. 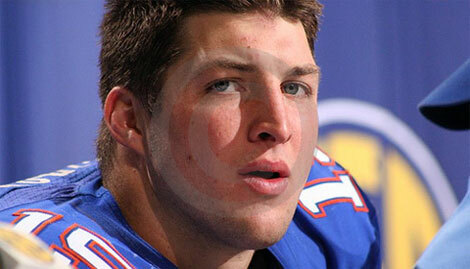 FOX will be setting up a "Star Cam" that will be isolated on Tebow for the entire game. Fans will be able to watch a constant video stream of this camera position on the FOX sports web site. FOXSPORTS.COM TO UNVEIL “STAR CAM” ON FLORIDA GATORS QB TIM TEBOW DURING ALLSTATE SUGAR BOWL – The collegiate football career of perhaps the most celebrated athlete in college sports will come to an end this Thursday, Jan. 1 when Tim Tebow takes the field for the final time in his Florida Gators uniform when they take on the Cincinnati Bearcats in the ALLSTATE SUGAR BOWL. In this highly anticipated, emotional farewell, FOXSports.com unveils it’s “Star Cam,” positioned high on the 50-yard line to be isolated on Tebow from the second he takes the field until the moment he runs into the locker room. A constant video stream of this select angle is available to fans by logging onto FOXSports.com or by clicking here: http://msn.foxsports.com/video/shows/Sugar-Bowl.